Was the Wednesday post-election rally a one-hit wonder? Was the FOMC, despite its surprisingly sparse statement, superhawkish? Was nothing actually fixed this week (narrator: "it wasn't") and are all the "same old" fears - trade wars, interest rates, China, tighter financial conditions, peak earnings, slowing global economy - haunting the market making a comeback? 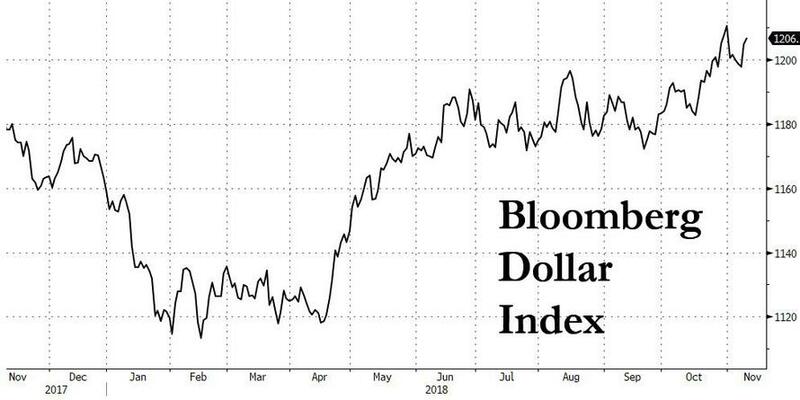 ... and as the dollar surge brings it just shy of the 2018 highs as the yuan resumed weakening on growing concerns about a slowdown in China, despite inflation data out of Beijing overnight that came in as expected. While the Fed's decision to hold rates was expected, some traders had expected an even more dovish approach and a mention of the October rout; its absence led to an overly hawkish take with the Fed confirming a December increase is a distinct possibility for the robust US economy. That contrasts sharply with China, where cooling producer price inflation and falling car sales suggested an economy struggling to gain traction. And as "plain vanilla" growth risks return now that the election is gone, stocks in Hong Kong and China were the main losers in Asia, where a financial sector sub-index fell more than 2 percent after China’s banking watchdog told lenders to allocate at least a third of new loans to private companies, raising the prospects of a jump in bad assets. Additionally, a decline in Chinese PPI, weak car sales and a disappointing outlook from a top online travel company combined to reignite lingering concerns about the health of the world’s second-biggest economy as BBG notes. As as result, the Shanghai Composite, a barometer for overall risk sentiment outside the US, continued to slide, and was down 1.4%, closing just below 2,600, its lowest level since the end of September. European stocks followed Asia lower, with Europe's Stoxx 600 Index down 0.7%, dragged lower by mining and energy shares after crude oil entered a bear market and most industrial metals fell, while disappointing forecasts from Richemont and Thyssenkrup AG also weighed on the index. US equity futures contracts pointed to second day of declines for U.S. stocks. Losses in equities pressured bond yields lower, with debt in Germany and the United States rising across the board, pressured by world trade frictions and a budget standoff between Italy and Brussels. Meanwhile, in FX, the confident Fed boosted the dollar, which had weakened sharply after mid-term elections this week raised the prospects of U.S. political gridlock. The greenback gained a quarter of a percent against the euro and half a percent against the British pound, and is back to just shy of its 2018 highs. The DXY dollar index gained 0.25 percent to 96.86. The Aussie swung to a loss as the central bank’s economic forecasts disappointed traders. The pound erased some of this week’s gains as the Irish border continued to be the biggest hurdle to a Brexit divorce deal; U.K. data was mixed, with the trade deficit shrinking while industrial production and services figures were underwhelming. In commodities, oil prices fell to multi-month lows as global supply increased and investors worried about the impact from soaring US output, set to hit a record 12mmbpd, and concerns about fuel demand from of lower economic growth and trade disputes. Benchmark Brent crude oil fell to its lowest since early April, down more than 18 percent since reaching four-year highs at the beginning of October. Also overnight, the sturdy dollar tarnished the appetite for safe-haven gold with the price down 0.2% at $1221.42 an ounce. Asian equity markets traded lower following a lacklustre lead from Wall St where the mid-term stock rally stalled as focus shifted to the FOMC. ASX 200 (-0.1%) and Nikkei 225 (-1.1%) were lower with energy stocks pressured after a continued slump in oil prices and as soft earnings results also clouded over Tokyo sentiment. Hang Seng (-2.4%) and Shanghai Comp. (-1.4%) were the worst hit in the region as tech and energy stocks lagged, while continued PBoC liquidity inaction and inline inflation data proved to be inconclusive for sentiment. Finally, 10yr JGBs were flat with prices uneventful as the pressure from the recent losses in T-notes was counterbalanced by the risk averse tone and BoJ’s presence in the market for JPY 980bln of JGBs across the curve. 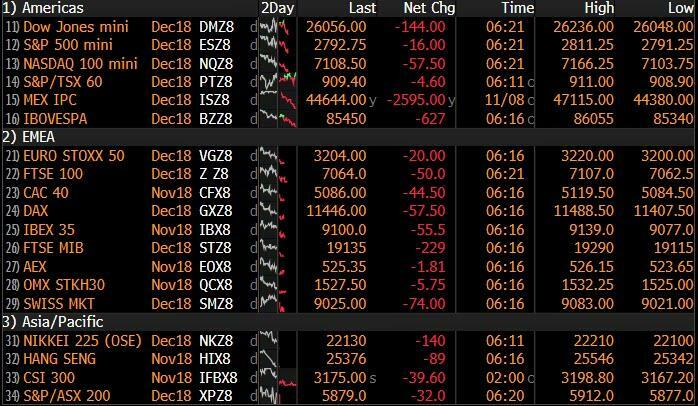 Major European equities are lower across the board (Eurostoxx 50 -0.8%) as the sentiment seen in Asia spills over onto the region. Material names lag amid the slump in base metal prices, while consumer staples outperform. The finance sector is also experiencing weakness with the likes of Spanish banks exposed to Mexico (BBVA -6.7%, Sabadell -2.8%, Santander -2.4%) pressured after Mexican banks fell overnight amid a surprise proposal from the incoming President AMLO to scrap bank fees. (Note: BBVA made 28% of its revenues and 34% of its operating income from Mexico last year.) Meanwhile, UBS (-4.3%) shares declines after the US Justice Department filed a lawsuit against the bank for defrauding investors in its sales of mortgage-backed securities leading up to the global financial crisis. Over in Germany, steel-maker Thyssenkrupp (-11.0%) shares slumped after the company announced a profit warning due to provisions for an ongoing cartel probe and quality problems at its auto business. Elsewhere, Richemont (-6.7%) shares declines amid disappointing earnings, hitting the likes of European Luxury names (LVMH -2.0%, Kering -3.6%) in sympathy. In FX, the dollar appears to have stopped for the Greenback on Wednesday, and its resurgence from mid-term election lows has been fuelled to a degree by the latest FOMC policy statement that effectively underpins market expectations for a December hike. Amidst almost universal gains vs currency counterparts, the index is now nudging 97.000 from just shy of 95.700 at one stage and the 2018 peak of 97.201 is back within striking distance. GBP - Brexit impulses continue to ebb and flow between positive vibes on deal prospects and the proverbial cliff edge withdrawal, but the bottom line is that Irish border and back-stop differences remain unresolved to leave the UK at risk of failing to agree terms at home and/or with the EU. Hence, Sterling has lost momentum and is underperforming alongside the NOK (undermined by much softer than expected Norwegian inflation data to trade down around 9.5700 vs the Eur) within the G10 ranks, as Cable teeters above 1.3000, and largely shrugged off a barrage of UK data (GDP firm and trade above consensus, but other elements less encouraging). CAD/EUR - The next worst majors, with Loonie hit by collapsing oil prices and sliding towards 1.3200 vs its US peer, while the single currency continues its relatively sharp and abrupt pull-back from 1.1500 to retest support ahead of the 1.1300 ytd low. Ongoing Italian-EU budget differences are weighing along with more signs of a slowdown, or even weakness in the Eurozone economy, while hefty option expiries are also eyed (1.1300 in 1.1 bn, 1.1340-50 in 2.0 bn and 1.1375 in 1.3 bn for example). AUD/NZD - Also falling prey to their US rival’s revival and hardly helped by neutral or wait-and-see policy guidance from the RBA or RBNZ, as Aud/Usd recoils to sub-0.7250 and Nzd/Usd backs off further from almost 0.6800 to under 0.6750. In commodities, WTI (-1.6%) and Brent (-1.4%) lost the USD 60/bbl and USD 70/bbl handles respectively, after the complex entered into bear market territory amid rising supply and concerns of a slowdown in global economic growth. Both benchmarks declined around 20% from the four-year highs reached at the front end of October and are set for a fifth straight week of declines, while North Sea Brent Crude hit seven-month lows. The slide has been exacerbated by US’ decision to permit eight countries to continue importing Iranian oil after the imposition of sanctions on the OPEC member, as well as record production of crude oil over in the States. Looking ahead, investors and traders will be focusing on this weekend’s meeting of OPEC and its allies where they are set to discuss output strategies in Abu Dhabi on Sunday. During the week, there were source reports that Russia and Saudi are to start discussing oil production cuts in 2019. This comes after OPEC’s October production reached the highest level since 2016, while Russia hiked its output in the prior month to recent highs of 11.4mln BPD. Producers on Sunday will have to discuss the threat of a glut alongside the prospect of lower demand from faltering EM economies and repercussions from US-Sino trade disputes. Elsewhere, metals trade lower across the board with copper underperforming amid post-FOMC dollar strength and concerns regarding slowing global economic growth. Among precious metals, spot gold (-0.3%) tracks USD action, with the yellow metal dropping to the lowest level this month, while spot silver (-0.4%) is set for its largest weekly percentage decline in nine weeks. US Federal judge blocked Keystone XL Pipeline stating that US administration's justification for the approval was incomplete, while the judge added that the State Department failed to evaluate climate impact, oil spills and cultural resources.